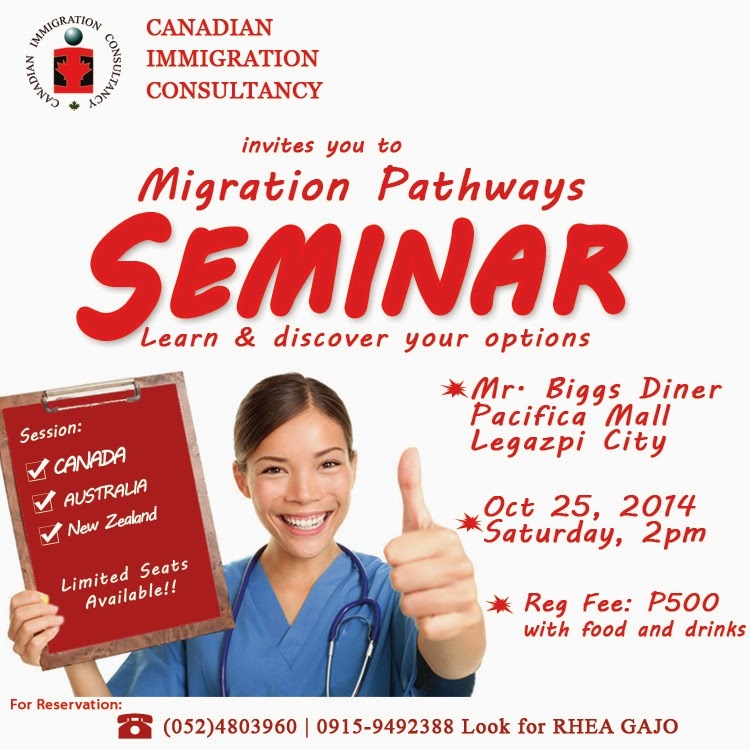 Migration Pathways Seminar - Legazpi City (Oct 25, 2014) - Gateway to Canada | Canada Immigration Consultancy! Live the life you have always wanted! Live and Work in Canada, Australia or New Zealand! If you are planning to live and work in Canada, be prepared for the Express Entry System to be implemented in 2015. If you got selected, you will only have 60 days to file your application. Visa processing will only be 6 months or less! Let us help you get ready! Our Registered Migration Agent for Australia does a free assessment. If Australia is your chosen destination, we can help you too with a very flexible and reasonable fee. Planning to Study in New Zealand? By taking a Diploma Level 7, you can work while studying and will be entitled to one year job search visa. Let us guide you to avoid wasting your time and money! Learn and discover your options, attend our Migration Pathways Seminar in Legazpi City this coming October 25, 2014 at Mr. Biggs Diner located at Pacific Mall, Lagezpi City. For reservation, you may contact Ms. Rhea Gajo at Tel No. 052-4803960 or Mob No. 0915-9492388 or 0919-3913960.